The Tigers play so far this season has me disappointed beyond words, but that’s another post for another time. Today I want to talk about something the Tigers’ front office is doing right. 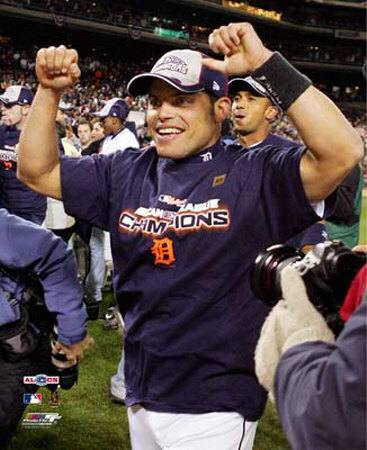 Earlier today, it was announced, in conjunction with the Tigers organization, that Magglio Ordonez will officially retire from baseball Sunday; thereby retiring as a Tiger. I for one couldn’t be happier. I wrote in an earlier post how the acquisition of Pudge Rodriguez was the front office’s first step in returning the Tigers to relevance. That being said, the front office’s second step, and perhaps a greater step towards on-field improvement, was the signing of Magglio Ordonez. That’s no disrespect to Pudge; but it was widely accepted that his best years of his career were behind by the time he signed with the Tigers. That was quite simply the greatest moment in the history of Comerica Park and the the team’s wake up call to the baseball world. The bottom of the 8th inning yesterday may have been the best half inning the Tigers have played all season. It’s also probably as much heart as the offense has shown all year. Renteria is FINALLY starting to hit the ball. It only took him about 5 months to get warmed up! Seriously though, he’s been getting some key hits when the Tigers needed them. BTW – his average is higher than Sheffield’s. Go figure. That didn’t take too long. Speaking of Sheffield, was anybody surprised to see that nobody claimed him while he was on waivers? Galarraga continues to impress me. Every time he pitches, I always expect the opposing team to figure him out after their first at bats. Hasn’t happened yet. What a steal he was! Despite the anemic offense and the bullpen, Robertson had a solid outing in his last appearance. Let’s see what he can do tonight.